Running an existing .NET Framework-based application in a Windows container doesn't require any changes to your app. 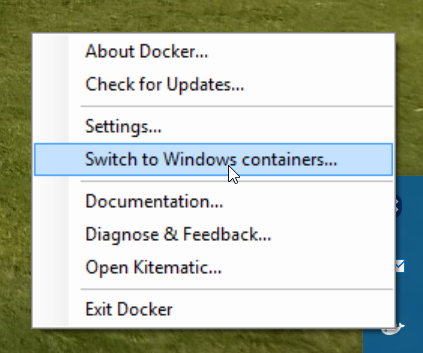 To run your app in a Windows container you create a Docker image containing your app and start the container. This topic explains how to take an existing ASP.NET MVC application and deploy it in a Windows container. You start with an existing ASP.NET MVC app, then build the published assets using Visual Studio. You use Docker to create the image that contains and runs your app. You'll browse to the site running in a Windows container and verify the app is working. This article assumes a basic understanding of Docker. You can learn about Docker by reading the Docker Overview. The app you'll run in a container is a simple website that answers questions randomly. This app is a basic MVC application with no authentication or database storage; it lets you focus on moving the web tier to a container. Future topics will show how to move and manage persistent storage in containerized applications. Creating a publish task to build the assets for an image. Building a Docker image that will run your application. Starting a Docker container that runs your image. Verifying the application using your browser. The finished application is on GitHub. If you are using Windows Server 2016, follow the instructions for Container Host Deployment - Windows Server. Collect all the assets that you need to load into a Docker image in one place. 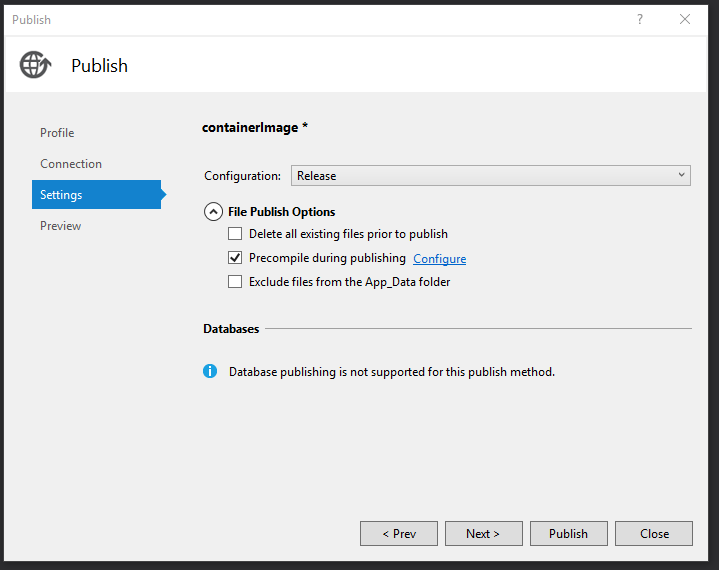 You can use the Visual Studio Publish command to create a publish profile for your app. This profile will put all the assets in one directory tree that you copy to your target image later in this tutorial. Right click on the web project in Visual Studio, and select Publish. Click the Custom profile button, and then select File System as the method. Choose the directory. By convention, the downloaded sample uses bin\Release\PublishOutput. Open the File Publish Options section of the Settings tab. Select Precompile during publishing. This optimization means that you'll be compiling views in the Docker container, you are copying the precompiled views. Click Publish, and Visual Studio will copy all the needed assets to the destination folder. Create a new file named Dockerfile to define your Docker image. Dockerfile contains instructions to build the final image and includes any base image names, required components, the app you want to run, and other configuration images. Dockerfile is the input to the docker build command that creates the image. 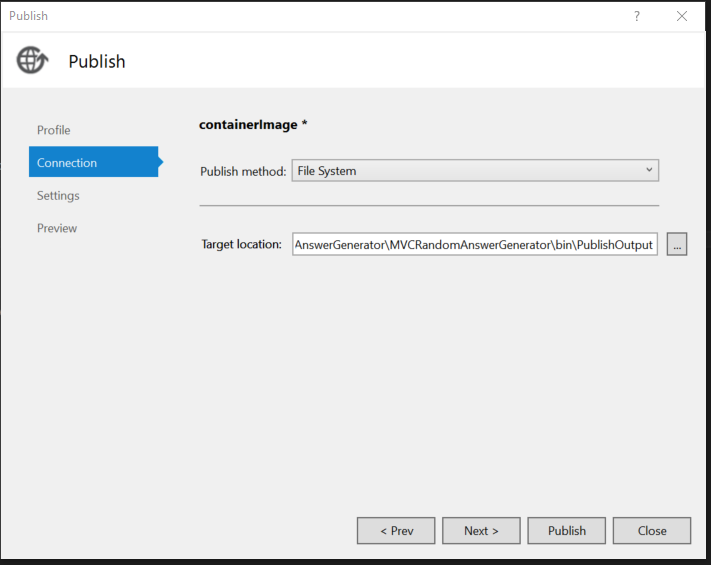 For this exercise, you will build an image based on the microsoft/aspnet image located on Docker Hub. The base image, microsoft/aspnet, is a Windows Server image. It contains Windows Server Core, IIS, and ASP.NET 4.7.2. When you run this image in your container, it will automatically start IIS and installed websites. There is no ENTRYPOINT command in this Dockerfile. You don't need one. When running Windows Server with IIS, the IIS process is the entrypoint, which is configured to start in the aspnet base image. docker build -t mvcrandomanswers . This command will build the new image using the instructions in your Dockerfile, naming (-t tagging) the image as mvcrandomanswers. This may include pulling the base image from Docker Hub, and then adding your app to that image. The IMAGE ID will be different on your machine. Now, let's run the app. The -d argument tells Docker to start the image in detached mode. That means the Docker image runs disconnected from the current shell. In many docker examples, you may see -p to map the container and host ports. The default aspnet image has already configured the container to listen on port 80 and expose it. The --name randomanswers gives a name to the running container. You can use this name instead of the container ID in most commands. The mvcrandomanswers is the name of the image to start. Once the container starts, connect to the running container using http://localhost in the example shown. Type that URL into your browser, and you should see the running site. Some VPN or proxy software may prevent you from navigating to your site. You can temporarily disable it to make sure your container is working. The command above builds the image, displays the list of images on your machine, and starts a container.